Like the Mona Lisa, James Abbott McNeill Whistler’s Arrangement in Gray and Black No. 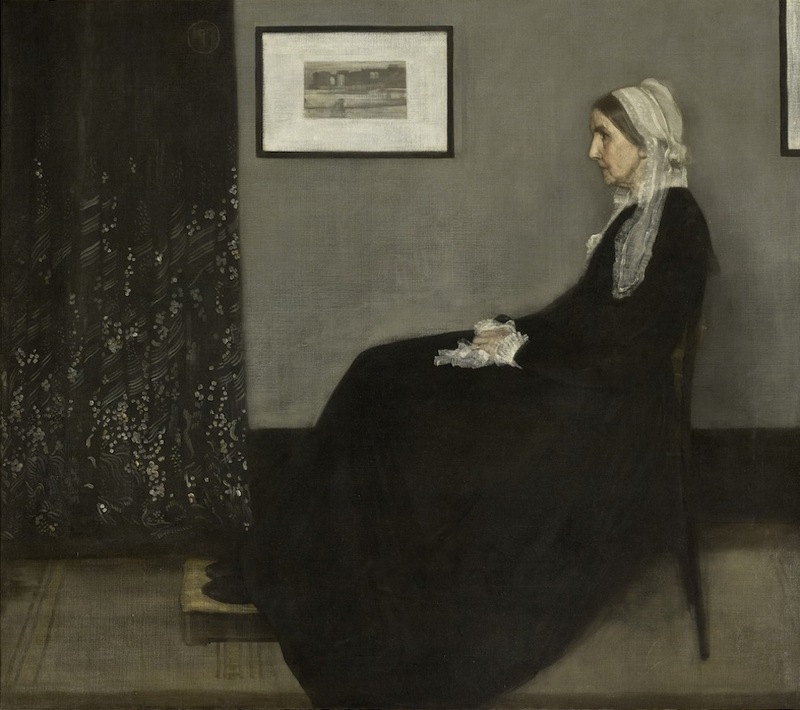 1 (1871), better known as “Whistler’s Mother,” is an icon of Western art. Both paintings belong to a long tradition of portraits of seated women, but they have surpassed the genre and earned spots in the visual vocabulary of pop culture. In faithful reproduction or in parody, both women are instantly recognizable as art and as symbols: Mona Lisa’s smile is a byword for mystery and enigma, while the patient, serious pose of Whistler’s mother has come to represent a particularly American strain of Puritan stoicism. While visitors to the Louvre are surprised by the petite size of Leonardo da Vinci’s portrait, “Whistler’s Mother” may have the opposite effect on visitors to the Norton Simon Museum in Pasadena, Calif., where it’s on view until June 22 in the exhibition “Tête-à-tête: Three Masterpieces from the Musée d’Orsay,” along with Édouard Manet’s Émile Zola (1868) and Paul Cézanne’s The Card Players (1892-1896). As an intern at the Norton Simon, I’ve found that visitors expect Arrangement in Gray and Black No. 1 to be fairly small, on a scale to match its domestic subject. It isn’t. Framed, the painting is over six feet tall and almost seven feet wide; Anna McNeill Whistler (1804-1881) is nearly life-size. Hanging on the museum wall, she towers over all but the tallest museum-goers. Her ramrod posture and steady gaze, at once severe and serene, amplify the painting’s already-impressive physical presence. In 1883, when the painting was first displayed in Paris, French satirists attributed its gray palette to London’s famously foggy, polluted climate. Whistler was born in Lowell, Massachusetts, but spent only his early childhood and a few years in his 20s in America. Given the artist’s expatriate status, and the fact that the painting has resided in France since 1891, it is perhaps surprising that Arrangement in Gray and Black No. 1: Portrait of the Artist’s Mother has become so well-known in America. Yet Whistler always identified himself as an American. Although Whistler’s personal style drew upon an eclectic range of European and Asian traditions, the portrait of his mother tethers him to his American roots. The purchase of his Arrangement by the French government was a point of national pride—this was the first painting by an American to enter France’s national collection. Its omnipresence in popular media (from advertisements to Mr. Bean) has cemented its status as an icon. I was lucky enough to see all three paintings upon their arrival from Paris. Part of my dissertation deals with Whistler’s decorative work, so I made a beeline to examine his most famous artwork before it went up on the museum wall. Magnifying glass in hand, I was especially struck by the delicacy of the paint; close up, it becomes clear that Whistler used very thin oil paints, heavily diluted with turpentine, to create semi-translucent, watercolor-like tinted washes. All across the surface, the coarse weave of the unprimed canvas surface is visible. This medium allowed the artist to achieve the delicate gradations of light and dark in his sitter’s face, framed in a lace cap, the mottled surface of the gray wall, and the patterned fabric (possibly a kimono) hanging on the left. The subtlety in Whistler’s tones was not always appreciated, however. In 1883, when the painting was first displayed in Paris, French satirists attributed its gray palette to London’s famously foggy, polluted climate. Arrangement in Gray and Black No. 1 was also a bold artistic statement, especially to the eyes of Victorian viewers. When the painting was first exhibited at London’s Royal Academy in 1872, audiences were baffled. Compared to the highly finished surfaces and dense, colorful compositions more typical of Academy artworks, Whistler’s portrait is dramatically pared-down. To 19th-century audiences, Whistler’s painting looked unfinished, and the setting seemed impossibly empty. Even today, the room in which Whistler posed his mother is striking in its bareness—and its geometric regularity. It is all straight lines and right angles: striped rug, box-shaped footrest, dark wood paneling, and framed prints (of Whistler’s own etchings) on the walls. Alfred Barr was also instrumental in securing a place for “Whistler’s Mother” in the American consciousness. In 1932, in order to raise money for the fledgling MoMa, Barr sent the painting on a yearlong whistle-stop tour of 12 American cities, including 18 days in Los Angeles. By the time the painting returned to Paris, millions of Americans had seen Arrangement in Gray and Black No. 1, and extensive press coverage of the tour reached millions more. The U.S. Postal Service even issued a Mother’s Day stamp featuring the painting, though they added two details that Whistler would probably not have appreciated: a caption reading “In Memory and in Honor of the Mothers of America,” and a vase of flowers in the lower left corner. Whistler may have intended for the painting’s forceful geometry to stand on its own as a source of formal interest—he first called the painting an Arrangement, after all, rather than a portrait—but the composition also underscores his mother’s strong personality and their close relationship. A second-generation American of Scottish descent, Anna Whistler’s friends and family remembered her as pious and hard-working. After the early death of her engineer husband in his 40s, Anna never remarried; the black mourning dress she wears in her portrait attests to her widowhood. Thrifty, industrious, and pious, Anna did not always approve of her son’s bohemian lifestyle in London and Paris, but they lived together in Chelsea quite happily for almost a decade. He painted the Arrangement during this period; his mother, who was 67 at the time, sat for him to fill in for a tardy model. The two had always been close: when his contemporaries expressed surprise that such a cosmopolitan artist could have come from rural New England, Whistler explained (with characteristic flippancy) that he grew up in Massachusetts because “I wanted to be near my mother.” When Anna Whistler passed away in 1881, her son added his mother’s maiden name, McNeill, to his own. Arrangement in Gray and Black No. 1: Portrait of the Artist’s Mother has without question become the success that Anna wanted for her son. That, in itself, makes the exhibit a touching tribute to parenthood—the depiction of a real and loving relationship between a mother and the artist she raised. Caitlin Silberman is a doctoral candidate in art history at the University of Wisconsin-Madison, where her research focuses on intersections between 19th-century British art and the life sciences. From 2014 to 15, she is working at the Norton Simon Museum as a graduate curatorial intern. Open Art is a partnership of the Getty and Zocalo Public Square. Primary Editor: Becca Maclaren. Secondary Editor: Alexis Hauk. *Photo courtesy of Musee d'Orsay: Musee d'Orsay, Paris.